This essay identifies and assesses the general shift in the Russian foreign policy during Vladimir Putin’s presidency. The author uses the State of the Nation Addresses of Boris Yeltsin and Vladimir Putin to make a comparative analysis of the presidents’ foreign policy approaches. The case studies focus on the US National Missile Defense, NATO expansion, the situation in Kosovo, the situation in Chechnya and US-Russian relations in the context of the global war against terrorism. The main argument of this essay is that a general shift in the Russian foreign policy had occurred during Vladimir Putin’s presidency owing to the rise in statist thinking. The beginning of the twenty first century marked the dawn of a new era in the US-Russian relations. The end of the Cold War in the late 1980s and the ensuing warm relations between the former adversaries brought the decades of geo-political, military, economic confrontation and of the competition for the spheres of influence across the globe to the end. The collapse of the Soviet empire resulted in a form of an alliance between Moscow and Washington in the first half of the 1990s, when president Yeltsin was the head of the Russian state, which abruptly deteriorated into fragile interstate relations filled with mutual suspicion, mistrust and confrontation after Vladimir Putin succeeded Yeltsin as the new Russian leader. During the Soviet era the confrontation and the inability to bridge the gap between the superpowers could be understood in the broader context of the ideological struggle. In the mid-1990s, however, when Russia’s leadership vowed to support the ideals of democracy and market economy and when the western world no longer expressed concerns about the spread of communism in Europe, other factors came into play. For instance, growing political pressure caused by declining economic conditions, wide social discontent and a threat posed to state security by the secessionist movements in the Caucasus brought Vladimir Putin to power and gave him wide political support. Given these adverse domestic conditions, there was a demand for strong leaders in Russia and it was then that the first Russian President Boris Yeltsin hand-picked Vladimir Putin to lead the country out of chaos and disorder. Putin decided that moving away from the adopted by Yeltsin Western-oriented policy course would serve Russia’s national strategic interests better. Generally, he maintains a hard-line stance on all foreign policy issues, especially those dealing with US-Russian relations, which resulted in the renewal of political tensions between the two countries, reminiscent of the confrontation during the Cold War era. When Putin succeeded Yeltsin as president, the Russian policy toward the United States began to shift – from a soft confrontation, economic and political cooperation and reciprocal support to a cold, aggressive and highly pragmatic diplomacy, accompanied by military demonstrations, strong rhetoric and other conspicuous aspects that characterize current Russian foreign policy. This change was mainly aroused by the former President Putin’s personal perceptions of Russia’s new political and military standing in the world and his strong patriotic convictions. Relations were further strained when George Bush succeeded Bill Clinton as US president in January 2001 mainly because he made the final decision to implement the project rapidly. The unilateral withdrawal of the United States from the arms control treaties and the aspiration of its leadership to expand its military presence and to pursue its geo-political objectives in the areas of traditional Russian influence in Europe and across the globe, had sparked a new cycle of struggle, when Russia, led by the newly-appointed President Vladimir Putin, was rising as the energy superpower and an important world actor willing to be reckoned with on matters related to global security. Certainly, sky-rocketing oil prices, high dependence of foreign markets, primarily European, on Russia’s energy resources, and an economic boom accounted for the form of the tone with which Putin asserted the country’s position on the global political arena. More importantly, however, this assertiveness mirrors a highly substantial agreement among the Russian political and public circles on the nature of Russia’s new role in the world, inspired by the patriotic convictions of the former Russian President Vladimir Putin. During the early 1990s, the situation was drastically different, when Russia, dependent on foreign, mainly US economic assistance and investments, sought to collaborate with the West on a multitude of issues, from liberal reforms to disarmament and space program to economic transformations. This essay will identify and assess the shift in the foreign policy of the Russian Federation during Vladimir Putin’s presidency. In order to illustrate the dramatic shift in Russia’s foreign policy, a comparison of two time periods will be drawn – the foreign policy trends from 1992 to 1999 and from 2000 to 2007 under Yeltsin’s leadership and under Putin’s leadership, respectively. This essay argues that, first and foremost, the drastic change of Russia’s foreign policy was driven by the former President Putin’s heightened sense of patriotism and the belief that state control is the key to progress, stability and the restoration of Russia’s global power status. To illustrate the change of the foreign policy course a comprehensive comparison of the State of the Nation addresses of two Russian presidents will be drawn. A number of case studies will be assessed to support the main argument of the essay. The paper will focus on the US National Missile Defense, NATO expansion initiatives, the situation in Kosovo, the war in Chechnya and the evolution of US reactions to it, as well as the US-Russian relations in the context of the global campaign against terrorism. By drawing a comprehensive comparison of the annual State of the Nation addresses of Putin and Yeltsin, the author will identify the shift in the positions toward these aspects of foreign policy and analyze the implications of the statements made. Russia will be a strong country with modern, well-equipped, and mobile armed forces, with the army prepared to protect its homeland and its allies, the national interests of the country and its citizens. Our history shows that a country like Russia will exist and prosper only if it is a great power, yet in time of economic or political crises there has always been a threat of disintegration. The statement points to his concern about the potential cessation of the Muslim-populated regions. It also highlights the paramount necessity envisioned by Putin to suppress the separatist movements by force of arms under the pretext of the war against international terrorism and to project strong Russian influence across the entire North Caucasus. without developed civil society institutions, state power will inevitably become totalitarian and despotic. It is because of civil society that this power serves the interests of citizens. The distinction of the situation in Russia is that parallel to building civil society institutions, democratic foundations are being developed in so far as a democratic society cannot exist without a civil society. It is not about the interference of the state with the life of the civil society structures and not about equipping these organizations with executive powers, but about a targeted assistance of those institutions that are capable of consolidating the democratic potential of the power. Generally, there is a more pronounced tendency in the statements made by Vladimir Putin to impose state control and use coercion and violence against the separatist movement in Chechnya in an effort to prevent the disintegration of the Russian state. What is more important is that some of Putin’s policy actions and statements go beyond the constitutional constraints and explicitly inspire intolerance against the minority populations of Russia, thereby reducing the domestic ethnic cohesion. In contrast to that, Yeltsin had always emphasized the involvement and the significance of democratic institutions and civil society in tackling ethnic problems. In the wake of the terrorist attacks in New York and Washington, Vladimir Putin offered the US leader his country’s strong support in operations against Al-Qaida bases in Afghanistan. This included intelligence cooperation, opening Russian airspace for humanitarian aid flights, participation in rescue operations as well as compelling the Central Asian leaders to provide support to the US intervention forces. There was logic behind these actions. In his February 2002 interview to Wall Street Journal, Putin expressed his willingness to provide alternative energy market opportunities for the United States. At that time, Russia was the major oil producer, yet only one percent of imported American oil had Russian origins. Putin anticipated an increase in the production of crude oil much of which was intended for export, mostly to the United States. Eager to engage the United States, Putin was careful not to overly express his opposition on the long-standing issues, such as the NMD, NATO expansion and the situation in the former Yugoslavia. His decision to support the US invasion of Afghanistan derived from the goal to oust the Taliban regime and to replace it with the Russia-backed Northern alliance. However, while offering his support, Putin made it clear that Russia will not engage in the military operations because of the painstaking domestic and international authorization process. In return for his support of the US invasion of Afghanistan, he expected a US approval of his policies in Chechnya and, possibly, accession to WTO. That is why President Putin decided to support the US campaign against terrorist networks in Afghanistan. When the Bush administration announced its plans to overthrow the Saddam Hussein regime and to proclaim a democratic Iraq, Russia responded in a different manner. Putin decided to join the coalition of the opposing countries. Not convinced by the US arguments about the WMD threat, he was insisting on the broader UN involvement, thereby asserting his disagreement with the US leadership. The decision to oppose the US invasion was again driven by the pragmatic calculations of Vladimir Putin to benefit from the cooperation with the Iraqi regime under Saddam Hussein and by the reluctance to let US companies occupy the oil-rich country. In his 2003 State of the Nation address, Putin said: “Countries with highly developed economies are around us. I must say they push us aside from the lucrative world markets whenever possible. Their visible economic advantages give them the reason for geopolitical ambitions.” However, in the end, his efforts to oppose the invasion of Iraq were in vain and Russia could not use its veto power in the Security Council because of the Bush administration’s negligence of international normative standards and unilateralism. In an effort to eradicate the domestic sources of terrorism and to project the Russian influence across the former Soviet territories, Putin patiently assembled a coalition of empathetic countries from among the former ideological allies and formed a security bloc, similar to NATO, the Shanghai Organization of Cooperation. He succeeded in pulling available military and intelligence resources in the region, both bilaterally and multilaterally. The State of the Nation addresses of Yeltsin and Putin examined in this paper suggest that there was a shift in the foreign policy course of the Russian state from the expressed commitment to consolidate the bilateral cooperation with the US, to develop civil society institutions and to build a free market economy during Yeltsin’s presidency to a strong political and diplomatic opposition by Vladimir Putin of all US-backed security initiatives, military and economic coercion, the centralization of executive power and the willingness to use military force in tackling political problems both domestically and internationally. 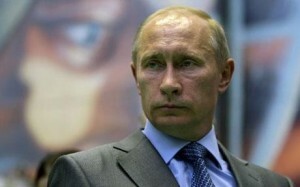 The shift is mainly manifest in the rhetoric and policy actions of Vladimir Putin and members of his administration. Although many other factors can explain the difference in the foreign policy approaches of Yeltsin and Putin in the context of the US-Russian relations, such as different personalities, distinct socio-political circumstances that accompanied both leaders, distinct manners of speaking, particular personal relationship chemistries and different manners of reacting to US proposals; most importantly, however, the change of the foreign policy course can be seen as a consequence of Putin’s strong personal conviction that the status of Russia as a global power can be restored by means of consolidation of coercive state power. Arousing the nationalist agenda is one way of achieving that. Similarly, external threat can be seen as the instrument used by the elites to advance their narrow interests and to consolidate the power base of the ruling regime.